If you don’t search for software_reporter_tool.exe intentionally, you won’t notice it’s on your computer. It’s a software component for Google Chrome and installs automatically when the Google Chrome installation process began. Chrome is an open source Web Browser and since the initial release in 2008, it’s the most used and popular browser. It is also the most popular cross platform browser. Due to the popularity among users from different platform and devices, it uses a technique to automatically uninstall unnecessary programs which may harm the Chrome browser. What is software_reporter_tool.exe and why it’s there in Chrome? Software_removal_tool.exe is a Windows process offered by Google Chrome. It’s a software removal tool and removes unwanted programs from Operating System which may cause problems to existing Google Chrome browser. The default location of software_reporter_tool.exe is: C:\Users\%username%\AppData\Local\Google\Chrome\User Data\SwReporter\ software_reporter_tool.exe. As, it’s a software removal Windows process, it automatically searches and removes programs it doesn’t need or thinks harmful. If in case it removes a program you need, then you can manually remove software_reporter_tool.exe to prevent further removal of your needed programs. We recommend you to keep this program but still you want to disable it then here are the methods to disable it. Step 1: Find the Google Chrome installation directory in AppData folder. 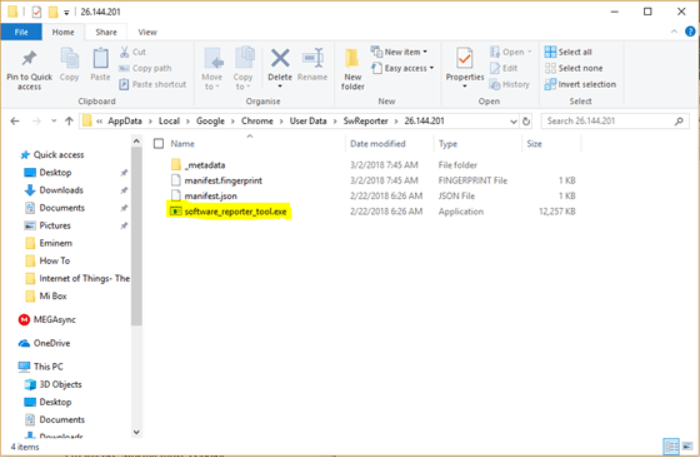 If you cannot find AppData, you might need to check the “View hidden items” boxes on windows 10. In order to do that, click on View on Windows File explorer check the Hidden Items checkbox. You can simply erase everything from that folder to delete or disable software_reporter_tool.exe. But the thing is, problems might occur when you update your Google Chrome browser. Chrome will re-download the tool. So, what you should do instead of erasing everything from that folder is clearing the content of that .exe file. Open software_reporter_tool.exe with notepad or other text editor i.e. : Notepad++. Now, clear everything from the displayed contents on notepad save your changes. Close notepad and the work is done. This process should disable the function of software_reporter_tool.exe and it will never be shown up on task manager or Windows process list. Why / when should you disable software_reporter_tool.exe? Being a part of Google Chrome browser, software_reporter.exe tool isn’t harmful for your computer. However, as it’s a software removal tool, it can remove wanted applications instead of unwanted programs from your computer. Sometimes, it can also be the reason for high CPU usages. So, in order to save the useful programs and save yourself from high CPU usage warning, you might need to disable or delete sofdtware_reporter-tool.exe. What will happen to Chrome after removal? No need to worry about Chrome browser, it will function properly as before. However, if you face any problem with Google Chrome after disabling software_removal_tool.exe, then reinstall Google Chrome to solve the problem. Fix Chrome Error “ERR_SPDY_PROTOCOL_ERROR” Permanently.